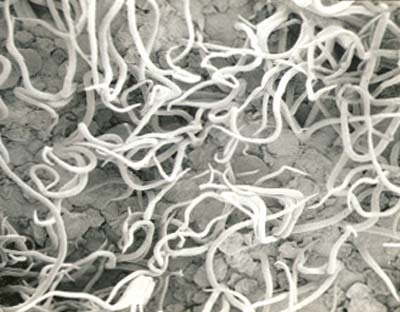 C. aquatica (F. Michx.) Nutt. Water hickory. Water hickory is found in low, wet woods from Texas east to Florida and north to southern Illinois and Virginia (distribution map). Individuals of this species can tolerate both a wetter site and a wider range of soil moisture levels than any other hickory, surviving on poorly drained, tight textured soils that are flooded in winter and parched in summer. 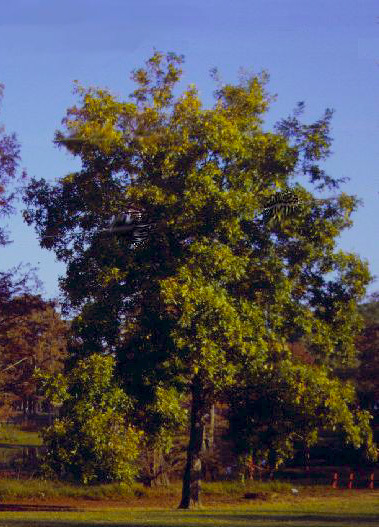 It is a major component of two forest cover types: Sugarberry&SHY;American Elm&SHY;Green Ash and Overcup Oak&SHY;Water Hickory (Fowells, 1965). In north Louisiana, water hickory is found in association with C. ovata and C. cordiformis on Guyton soils. 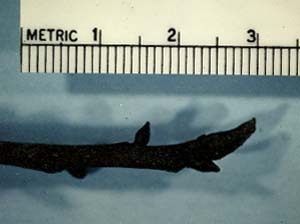 The position of the species is distinct, however, with water hickory occupiing the lowest, wettest sites (Grauke et al., 1987). C. aquatica is most easily identified by its nuts, which are very flattened, strongly 4 angled, and rough. Nuts are usually dark brown and thin&SHY;shelled, with very prominent lacunae. Husks are thin (<2 mm) and have prominent wings on the sutures. Kernels are crinkled, reddish&SHY;brown, and very astringent. 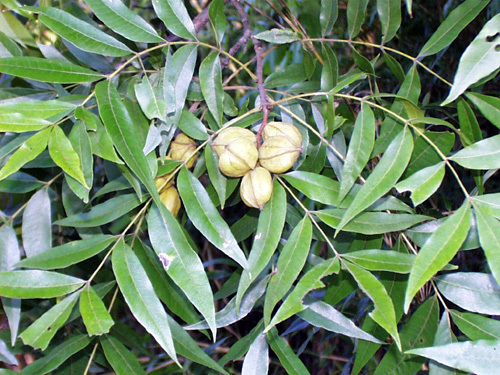 Distinguishing C. aquatica from pecan without fruit can be a challenge. In the author's experience, water hickory leaflets are usually more narrow and have smoother margins than pecan leaflets. Terminal buds become very dark brown or black with maturity and lateral buds often appear "greasy". Early spring growth is characterized by purplish shoots and rachises and by heavy pubescence, as in juvenile pecan shoots. Bark of trees varies from tight to shaggy. Sargent (1918) observed that the bark of trees growing in dry areas tended to be tighter than when trees grew in swamps. Wood of water hickory is considered inferior to that of other species of hickory, having a tendency to be "shaky" upon drying (Boisen & Newlin 1910). The bitter fruit makes the water hickory less desirable to wildlife than most other hickories, although nuts have reportedly been found in the stomachs of mallard and wood ducks. C. aquatica readily hybridizes with pecan where the two species occur on the same site, despite some phenological separation; water hickory is latter to flush growth in spring and to bloom (Grauke et al 1987). The morphological characteristics of the hybrid C. X lecontei are intermediate between the two parent species; flattened, rough and medium brown nuts are the most distinguishing characteristic of the hybrid (Stauder 1980). A disputed hybrid, C. X ludoviciana (C. aquatica X C. texana) was reported by Ashe (1927), based on material collected by Caroline Dorman near Chestnut, in Natchitoches Parish, Louisiana. 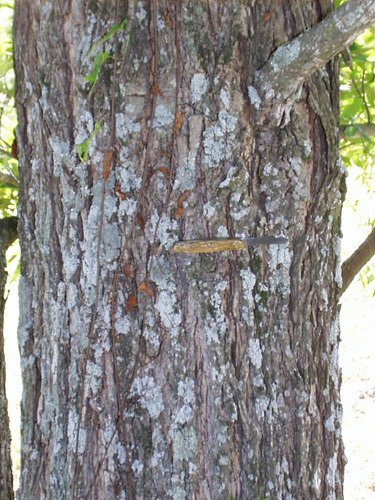 The influence of the water hickory was suspected, due to the flattening of the nut. 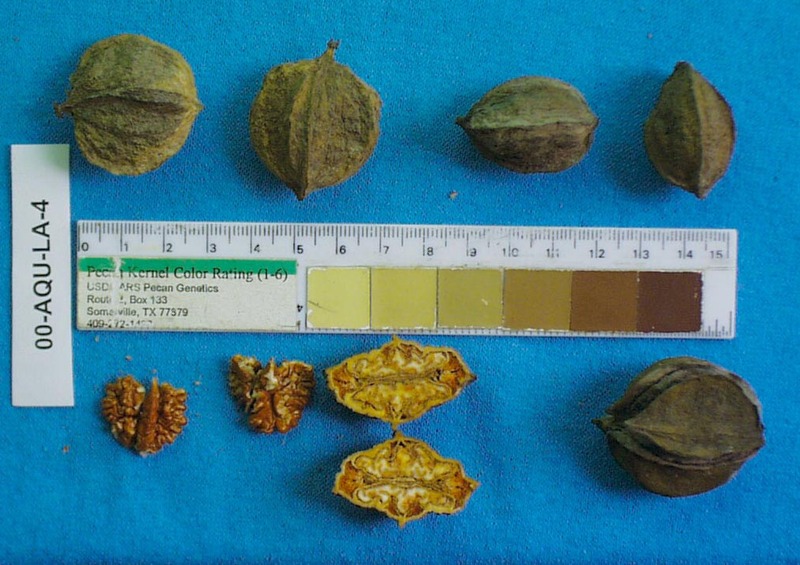 Since C. texana nuts can be somewhat flattened, it is possible that the specimen is a variant of that species, rather than a hybrid. 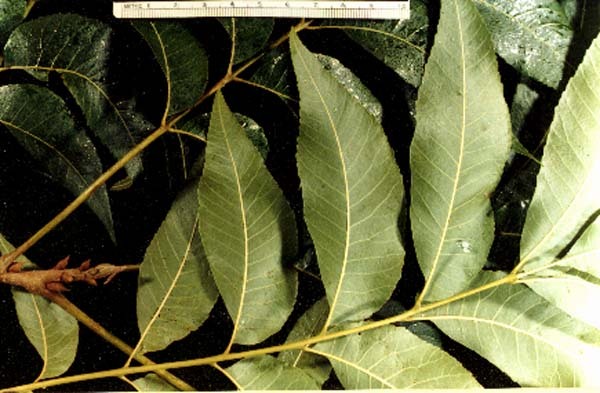 Significant research in relation to water hickory and its hybrid with pecan has been conducted at Louisiana State University, under the direction of Dr. John Toliver. Research has included the reliability of morphological characteristics in the distinction between different levels of hybrid (Rousseau 1976, Stauder 1980) as well as characterization of the growth of hybrid trees as compared to parent species (Toliver 1983). A planting of hybrids and parent species, some of which are the result of controlled crosses, has been established at the LSU Idlewild Experiment Station.